You have long face shape if it’s shaped like a rectangle. Features of a long face are a square jaw and a square forehead. The ideal cut should: Make your face appear less boxy and more oval, the ideal face shape. 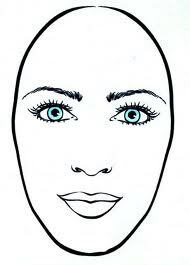 Oval shape faces are wider at the cheeks and slightly tapered at the forehead and chin. Stay away from very short hair. Soft layers around the face are always good. What looks best on long face shapes: Ask your stylist to create volume at the center of the face by cutting layers at the ear and cheekbones. This makes cheekbones appear wider and your face more oval. The overall length of your hair should fall below or above the chin so that the hairstyle doesn't compete with your strong jaw line. Long hair styles look fabulous on long faces. Just be sure to add layers in the sweet spot – the cheekbones. If your hair is superlong, you can also start layers below the chin. A haircut that ends at your chin. It draws the eye to the jaw, and would only accentuate the length and squared off features of a long face shape. Bangs: They help shorten a long face shape because they cover the forehead. Ask for gentle, side-swept bangs – a universally flattering look. If you're daring, a long face can pull off a blunt, severe fringe, to. If you're always pulling your hair into a ponytail, a move that emphasizes the long shape, bangs are essential for balancing the look. The main principle here is to shorten long faces by applying bronzer or blusher, and avoid highlighting or adding contours to your angular bits as this will make your face appear longer. Use a small amount of blusher or bronzer on your chin, and add blusher to the apples of your cheeks to enhance their roundness. Avoid contouring the hollows of your cheekbones as you'll get the opposite effect.